A new course yielded performances close to the event records. The start and finish moved from Old Town Square to Mustek, boasting an unrivalled atmosphere. 5300 runners flocked to the illuminated city streets to take on the METRO 10K race with a further 1200 running the adidas Women's Race 5 km. Kenyan runner, Daniel Chebii notched up yet another victory in the RunCzech Running League rankings. He proved his skills once again with a win in a personal best time and was only 1/100 of a second away from breaking the race record. Josephine Chepkoech set the inaugural best time on the new women's course, also in a new personal record. 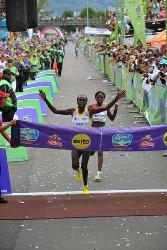 She beat the favourite, Emily Chebet, who had recently finished 4th in the 10000m at the World Championships in Moscow. Briton Gemma Steel stuck close to the Kenyan pair to finish third. "Running a night-time race was something completely new for me but it worked out pretty well," she said. 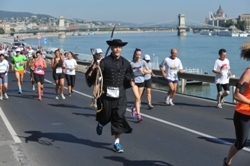 A record 12850 runners registered for the 28th edition, including 1330 relay teams. Foreign participation was also the at the highest level ever, with 1600 international runners from 65 different countries. Because of such demand runners started in three separate 'waves' with the last runner crossing the start line 13 minutes after the first. The race was held over a 5km loop, attracting 651 runners in the Marathon, but a total of 13,000 over all events, including 94 foreign runners from 13 countries. In front of his three immediate predecessors to hold the title, Wilson Kipsang became the current marathon world record holder. He broke his personal best, set two years ago in Frankfurt, by 19 seconds and Patrick Makau's 2011 Berlin world record by 15 seconds. In only his second marathon, former world 5000m track champion, Eliud Kipchoge finished second after pushing Kipsang up to the 37th kilometre. For the 40th BMW Berlin Marathon the seven breakers of eight world records in previous editions had all been assembled. Haile Gebrselassie, who had performed the feat in both 2007 and 2008, started the race in bright sunshine and a cool 8°C. After a hasty first kilometre in 2:44 the pace steadied at just under 3 minutes/kilometre. Pacemakers Edwin Kiptoo and Philemon Rono — both training partners of Wilson Kipsang — led a group of eight others through 10km in 29:16 and halfway in 1:01:32 on record schedule. From 23–28km the pace stagnated and hopes of a record faded. But from 28km, with a gentle downhill gradient, the pace picked up. After 30km, when pacing finished, it was a race between Geoffrey Kipsang, Kipchoge and Wilson Kipsang, who now seemed to be commanding the pace. They held together along the Kufurstendamm until 35km when Wilson Kipsang went ahead and Geoffrey Kipsang dropped back. Kipchoge chased, and lost little ground on the leader for the next two kilometres, but after 38km Wilson Kipsang's lead had grown and his eyes were now clearly fixed on a world record. Passing 40km he knew what he had to do: he went through in 1:57:12 compared to 1:57:20 in Frankfurt, so he had to run at least as fast as he had done then (6:22 for the last 2195m). Concentrating hard and taking five corners in the next kilometre, he launched himself along Unter den Linden and through the Brandenburg Gate with time to spare, covering the last 2195m in 6:11. There was another Kenyan duel in the women's race, with Florence Kiplagat, winner in Berlin in 2011 with 2:19:44, leading Sharon Cherop by a couple of strides up to 35km but Kiplagat thereafter eased away to win by 75 seconds. Another former winner, Germany's Irina Mikitenko, took third place in a new world "masters" (over 40) best. Sylvia Kibet just edged out her Paskalia Kipkoech after a thrilling duel over the final kilometre. Both were given the same time over the 12km course held at an altitude of 2625m of altitude: higher than Nairobi or Addis Ababa. The Peruvian pair of Gladys Tejeda, who won the Mexico City Marathon in 2:37:34 just five weeks ago, and Judith Toribio surprised by beating a number of better-known runners and coming home third and fourth respectively. The race started at a moderate pace with just 3:25 for the first kilometre on a slightly cloudy day but a leading group soon started to establish itself. After 25 minutes of racing around the 4km loop in the Colombian capital's Parque Simón Bolívar, Tejeda — who had done most of the work at the front — was accompanied by Kibet, Kipkoech and Ethiopia's Hiwot Ayalew, while Toribio and Mexico's Madai Perez began to struggle with the pace and drifted off the back. Tejeda kept trying to break away and succeeded in dropping Ayalew. The two Kenyans looked comfortable chasing Tejeda until about halfway around the last of the three circuits, when they moved away with 2km to go. Aware of Kibet's track talents, having won two World silver medals over 5000m, Kipkoech pushed hard and entered the final kilometre in front, clearly trying to take the sting out of her compatriot's sprint, but with 300m to go the latter went into the lead for the first time in the race and it proved to be the decisive attack. 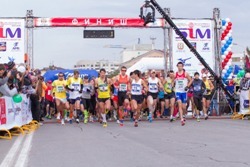 More than 17,000 runners participated in a variety of races for all age groups at distances from 2km to 12km. Part of the revenue generated by the race has been dedicated to supporting women's health campaigns, such as Liga Colombiana Contra el Cáncer, an organisation that fights cancer among women. More than 33,000 participants came from all over the world to complete the 42km, 21km, 10km and 5km races that weave around the beautiful city of Kuala Lumpur. The prize package offered was increased to US$112,000 this year and remains the highest in Malaysia.